The view from Ardhasaig, north of Tarbert. 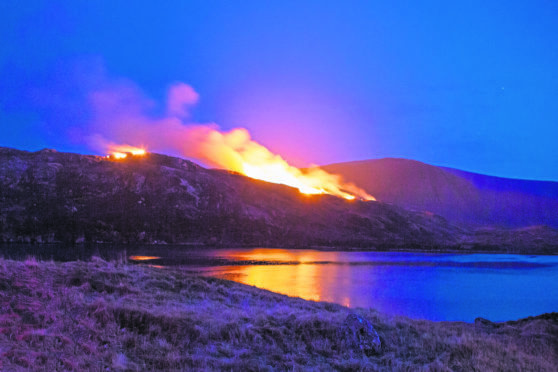 The fires continued along the hill range past Tarbert to Direcleit. Mobile phone services were also affected on Lewis and Harris as a result of the blaze on Tuesday night. The first power cut began just after 8pm and lasted around an hour. A further blackout hit Stornoway and the surrounding area about 9.45 pm and lasted several minutes. The original fault arose from the impact of a fire near one of the main transmission lines in Harris. Power finally returned to all areas around 11pm. Network operator SSEN apologised to all affected customers for the inconvenience after flames from the spreading moorland fire a few miles south of Tarbert knocked out the main national grid power lines at Diracleit, running from South Harris to Lewis. A SSEN spokeswoman said the fire service requested live electricity supply running through the high voltage overhead cable be switched off for safety reasons. The islands’ electricity supply runs through a subsea cable from Skye, making landfall in the Bay of Harris. The electricity is then carried through a 132kV overhead line circuit to Lewis. Meanwhile other moorland fires hit Lewis. Drivers were asked by police at 5.20pm on Tuesday to avoid the Pentland Road. The road was blocked by fire engines due to a grass fire on the moorland on the Carloway side. Another blaze affected Great Bernera.